Two masked intruders were caught on security cameras creeping through the Oklahoma State Capitol building on Wednesday night. 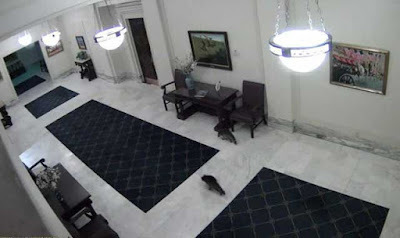 The trespassing raccoons checked themselves out in a senate hall mirror, before raiding cabinets for snacks in Senator Patrick Anderson's office. "The cabinet door was left open, and everything was kind of strewn about," said Kathie Darr, Executive Assistant in Anderson's office. "All of my things were outside the cabinet on the floor." The spree would be short lived though, they were caught in a bathroom hours later. The pair of bandits were issued a verbal warning, and handed over to OKC Animal Welfare. 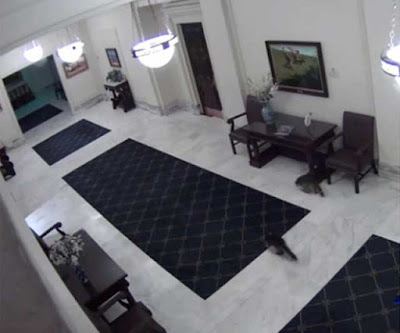 "We received a call," explained Lyne Huffman, field supervisor with Animal Welfare. "Brought them back here, so they could be kept in our wildlife room." The raccoons were taken to the Wildcare Foundation on Thursday, to be treated then released.